The standing flexion test is a test that can be used to assess sacroiliac joint dysfunction. It is best used in combination with other specific tests. A synonym is the Vorlauf test. 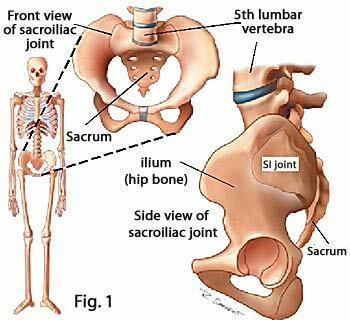 This test involves the sacroiliac joint (SIJ). It is the joint between the iliac bones of the pelvis and the sacrum (figure 1), a joint in which very little movement occurs (nutation and contranutation). It is a strong synovial joint, with both hyaline (on the sacral surface) and fibrous cartilage (on the ilial surface). Furthermore, the SIJ is reinforced by many ligaments connecting sacrum and ilium, and which tend to relax in pregnancy. “The sacroiliac joint has been implicated as a possible cause of low back pain by many authors (Grieve 1976; Erhard & Bowling 1977; Weismantel 1978; Mitchell et al. 1979; DonTigny 1985; Bernard & Kirkaldy 1987; Bourdillon et al. 1995; Schwarzer et al. 1995; Shaw 1992, Maigne et al. 1996).” Some authors claim it to be a major cause of low back pain, others rather think it is an uncommon source of low back pain. Therefore, the SIJ is often evaluated by clinicians who examine patients with lumbosacral pain. Assessing SIJ dysfunction is important. Fig. 1: anatomy of the SIJ. The purpose of the standing flexion test is to assess sacroiliac joint dysfunction. This condition can result from a variety of causes, including osteoarthritis, gout, rheumatoid arthritis, pregnancy, ankylosing spondylitis, … It is a state of altered mobility within the sacroiliac joint’s range of motion, causing changes in the structural relationship between the sacrum, the ilium and one or both legs. It is characterized by a reduced mobility in the affected joint, which will be noticeable when performing the standing flexion test. However, the standing flexion test alone is not enough to diagnose SIJD. Additional testing is preferable. The patient stands erect, with his feet at shoulder width. The therapist stands or squats behind the patient and places his thumbs directly under each posterior superior iliac spine (PSIS). The patient bends forward, starting with flexing the neck, then the upper thoracic spine to the lumbar spine, and as far as possible while keeping the knees extended. The therapist will observe each PSIS and their movement. Each PSIS should move an equal amount in a superior direction.If one PSIS moves further cranial than the other, the test is positive. The side with the greater movement is the affected side, because an articular restriction between the ilium and sacrum occurs. The sacrum will bend forward along with the lumbar spine, and if there is an articular restriction in the SIJ, nutation will occur less in that joint than on the other side. This test is indicative for sacroiliac joint dysfunction (SIJD), but only when combined with other specific tests with the same outcome. Medical imaging (CT-scan, MRI) may be needed to provide further evidence of SIJD.